Call in Special!! Book this activity with a second activity and receive $10.00 off per person on the second activity. Specials may not be combined with another special. 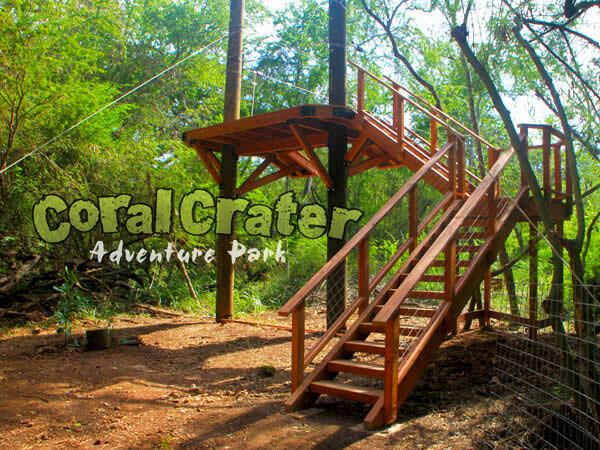 Coral Crater Adventure Park is Oahu's newest visitor attraction, located about an hour west of Waikiki in Kapolei. 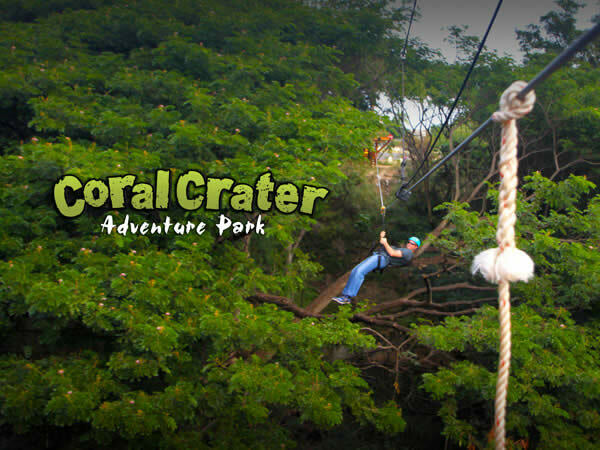 The park is home to an exciting zipline trek that includes 6 ziplines ranging from 300 to 900 feet. 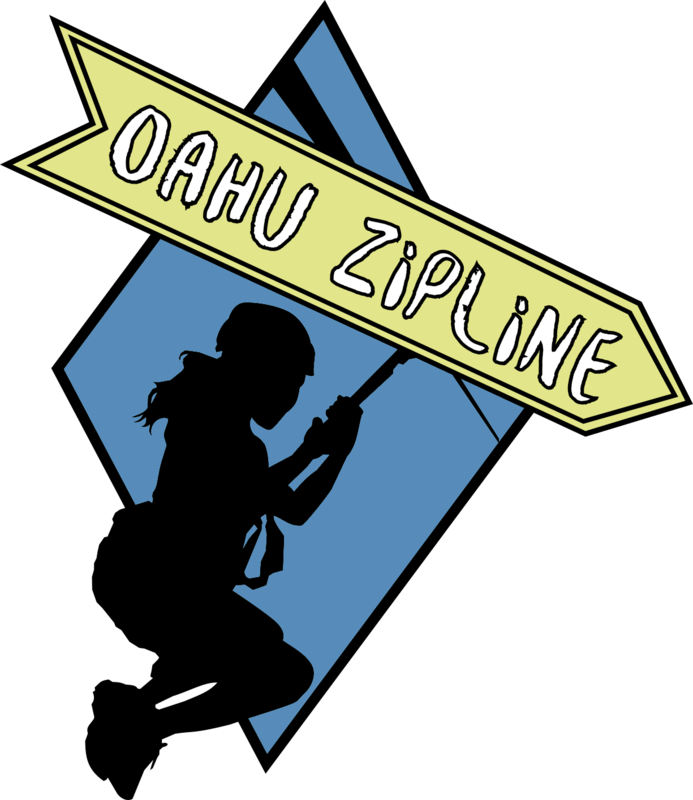 Best of all, the ziplines are perfect for beginners and experienced zipliners alike because they feature the most modern braking system, meaning that you don't need to control your speed or stop yourself. Got kids? Bring them along. 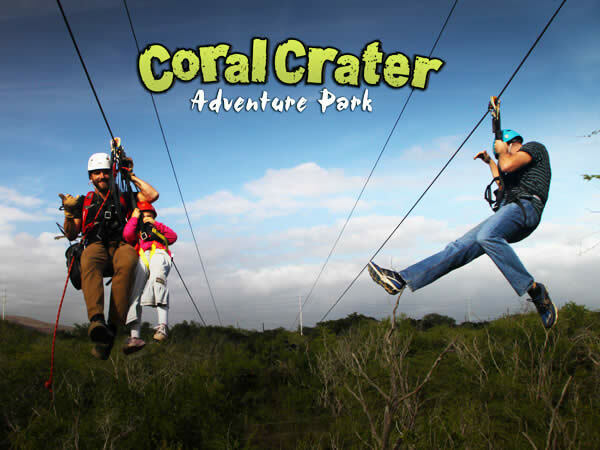 Coral Crater's zipline course is suitable for kids age 6 and up (within weight restrictions). 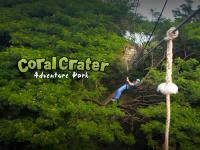 The Coral Crater zipline tour is a fun adventure for all!  Optional Add-On: Select the Laser Gun add-on and you will receive a laser gun that you can use on 3 of the ziplines to shoot targets along the way. Check in 15 minutes prior to tour time at 91-1780 Midway Rd, Kapolei, HI 96707. Roundtrip transportation from Waikiki and Ko Olina is available for an additional fee. If you select transportation from Waikiki, the exact pick-up time and location will be emailed to you. From Waikiki, get on H1 West. Drive from I-H-201 W and I-H-1 W to Makakilo. Take exit 2 from I-H-1 W toward Makakilo/Kapolei/Kalaeloa. Pass Kapolei High School on your left. Turn Left on Roosevelt Ave. The next right is Midway St and Coral Craters parking lot is on the corner. 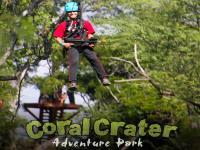 Coral Crater Adventure Park recently opened and not all GPS systems have the correct coordinates of the park. Most users experience an issue with Apple Maps, whereas, Google Maps seems to have the proper location. Below we provide two links that have the proper location data. If you are using an iPhone or other smart phone, these links will open the proper GPS location of the park in the respective application. 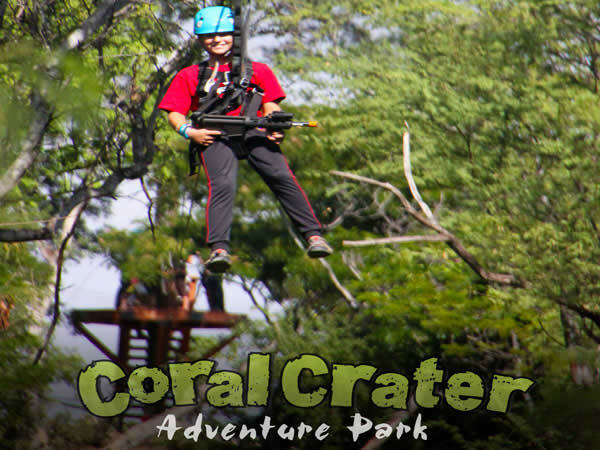 Coral Crater is on the corner of Roosevelt Ave and Midway St.
All participants will be weighed in, fully clothed, during the check-in process. Those unable to meet the weight requirement will not be permitted to participate and will not be offered a refund or rescheduled. 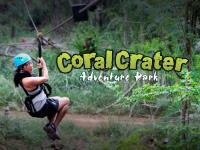 Participants with preexisting injuries, back, neck, or heart issues may not participate. 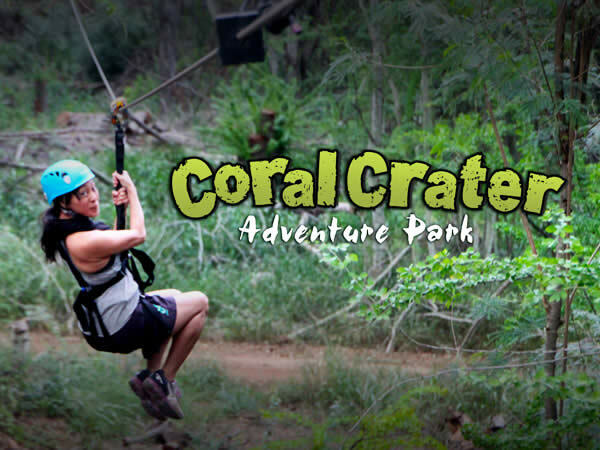 Please consult your doctor if you are unsure whether this activity is suitable for you. This is an outdoor adventure activity and operates in all weather conditions. Securable, closed-toed shoes are required. Athletic shoes are recommended. Long shorts or pants are suggested. Skirts, belly shirts and bathing suits, dangling earrings will not be permitted. 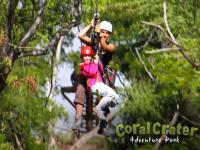 All safety gear and equipment is provided.